Seattle goats, specifically, ready to trim back your pesky shrubbery. “We bring the goats and unload him,” said Tammy Dunakin, head goat wrangler and owner of Rent-A-Ruminant LLC. “The second they hit the ground, they’re eating. It’s incredible to watch. It’s kind of like watching marbles scatter when you drop them on the pavement. And the goats start eating everything in sight." Dunakin's goats do work for the city – you may have seen them munching on hills alongside Interstate 5. Others goats have done work for Seattle City Light, clearing brush and opening pathways to steep rocky slopes. 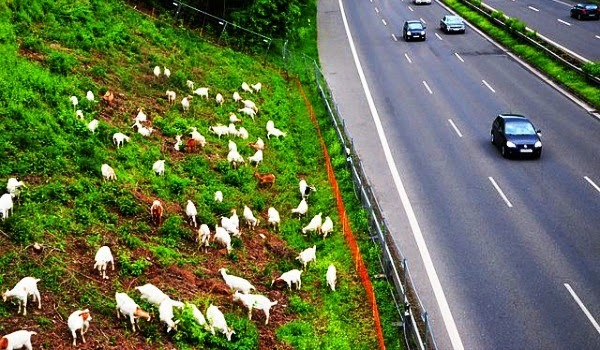 In a statement in 2006, landscape supervisor Betsey Searing explained why City Light chose goats to clear a slope: "The alternatives of clearing brush mechanically or with pesticides were rejected." "The slope is steep with large, irregular rocks, making it dangerous for people to work safely,” Searing said. “Mechanical equipment cannot reach far enough to do the job. It would require a large amount of herbicide to kill the vegetation and would leave a large mass of dry vegetation that could be a fire hazard. There also could be a danger of overspray reaching adjacent property." Amazon approached Dunakin to list her service, and she readily agreed. Dunakin heard from prospective customers on the day of the launch – she said her email just blew up. “We'll see how many jobs actually come out of that,” she said. But mostly, she was tickled by the newfound fame.